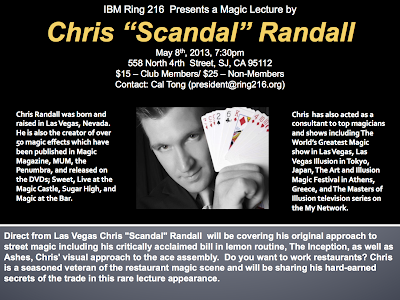 Direct from Las Vegas Chris "Scandal" Randall will be covering his original approach to street magic including his critically acclaimed bill in lemon routine, The Inception, as well as Ashes, Chris' visual approach to the ace assembly. Do you want to work restaurants? Chris is a seasoned veteran of the restaurant magic scene and will be sharing his hard-earned secrets of the trade in this rare lecture appearance. Chris Randall was born and raised in Las Vegas, Nevada, the entertainment capital of the world. His impressive upbringing lead him to be one of the top sleight of hand artists in the world today. He spent his childhood on the back stages of the Las Vegas Strip, developing a love of this craft from the masters of Las Vegas entertainment. While most kids were playing sports and video games, Chris was learning about Frank Sinatra, Elvis, and the History of the legends of Las Vegas entertainment. As a teen he attended the Las Vegas Academy of Performing Arts, majoring in Theater, Dance, and Technical Theatre. He studied during the day, but at night he became the house magician of the Stratosphere Hotel and Casino, or was hired for private parties or corporate events on the Strip. After graduation he began traveling the world with his unique brand of magic, introducing Las Vegas History with cutting edge magic technique. Over the next 15 years Chris brought his magic to the world. He toured Lebanon, Egypt, Japan, Canada, Mexico, Athens, Cypress, and across the United States appearing in review shows, on cruise ships, and television. He is also the creator of over 50 magic effects which have been published in Magic Magazine, MUM, the Penumbra, and released on the DVDs; Sweet, Live at the Magic Castle, Sugar High, and Magic at the Bar. 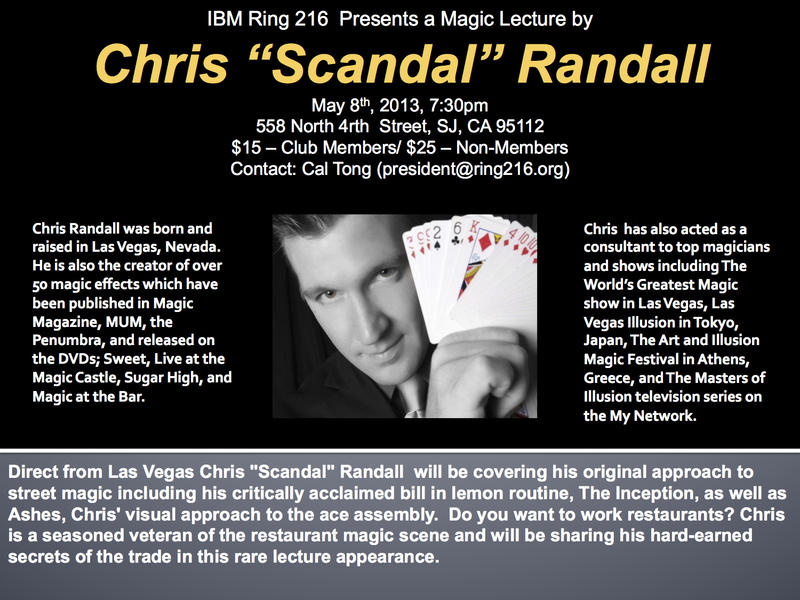 Chris presents many lectures across the globe and has been featured at the famed Magic Castle in Hollywood. He has also acted as a consultant to top magicians and shows including The World’s Greatest Magic show in Las Vegas, Las Vegas Illusion in Tokyo, Japan, The Art and Illusion Magic Festival in Athens, Greece, and The Masters of Illusion television series on the My Network. Chris’s creative and original sleight of hand magic has gained him the reputation as one of magic’s rising stars. I want to thank everyone for attending last nights event, "Celebrating the Magical Life of Mysterious Stan, Jr."
I was touched by the large number of Stan's family members who attended "The Tribute." Similarly, I believe Stan's loved ones were also touched by our dedicated night to Mysterious Stan Jr. 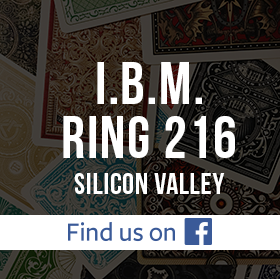 This was the first IBM Ring 216 Broken Wand ceremony and I was honored to play a part in this important service. It is my hope that our organization continues this tradition with the compassion that it deserves. A big thank you to broken wand manufacturer Craig Ousterling and all of you who helped set up, tear down, and bring food/drinks (you know who you are). A special thanks to our nine OUTSTANDING entertainers for the magical performances: Doug Eakin, John Jones, Ken King, Alan Leeds, Byron Walker, Fred Rasmussen, Patrick Reed, Scott Emo, and Will Chandler. I took over 100 pictures last night and will be posting the highlights soon. Niki came on stage (as the representative for Mysterious Stan's family) to accept our small gift, "a framed picture of the flyer for the event with Ring216 member signatures." Niki spoke of Stan from the perspective of their family and thanked us for the tribute and celebration. Out of the entire evening, it was Niki's speech that touched me the most.